Ask anyone in law enforcement and they will tell you that Proposition 57 is NOT a solution, and instead it is a total nightmare. Prop 57 is not a solution designed to make society safer. Simply put, this is a plan designed to fix a poorly run state’s budget shortfalls and overcrowded prisons by releasing even more convicted felons. Governor Jerry Brown, the man pushing this bill, is spending billions of tax dollars on a high speed train to nowhere because he likes trains* and has to figure out some way to attempt to balance the budget. The first step was when he signed AB 109, or the “Prison Realignment” bill into law. 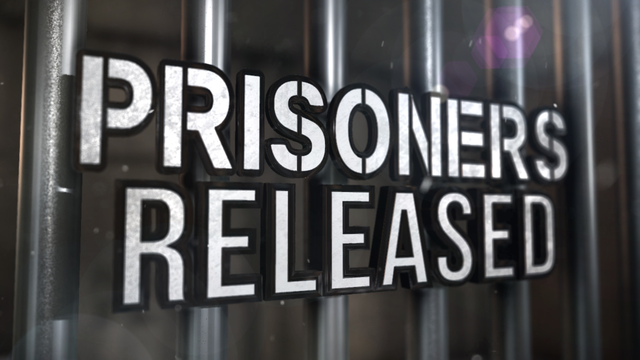 It was touted as a way to “reduce overcrowding, costs and recidivism.” Because it has been proven that releasing inmates early, lessening their punishments, reduces recidivism? No, no it hasn’t. The passing of AB 109 nearly instantly led to an increase in the crime rate. Some very violent criminals were released under AB 109 because their current reason for incarceration did not qualify as a “violent” crime. Not surprisingly, many criminals released under AB 109 went on to commit very violent crimes, including assaults, shootings and murders. There are plenty of sources documenting this, and news stories documenting some of the more heinous crimes committed by these released prisoners (except the stories notably rarely mentioned their early releases or ties to AB 109), but you have to go out and look for them as the people responsible for passing this travesty of justice sure aren’t going to let you know about it. The very day that bill passed, I predicted in writing that crime was going to increase dramatically. Here we are a couple years later and sadly, I was exactly right, which the FBI has confirmed. Since the passage of Prop 47, violent crime in California has skyrocketed. In just one year, the violent crime rate jumped 12% in California. While the liberal politicians responsible for this bill and even some media outlets refuse to draw the blatantly clear correlation between that rise in crime and Prop 47, it does not take a rocket scientist to figure out when there are more criminals on the streets, more crime is bound to occur. Heck, all one need do to find that out is to Google “prop 47 increased crime” and you will get an ample supple of scary reading material, likely far more than you want to read. Which brings us to where we are now, with more criminals on the streets, a climbing overall crime rate, a skyrocketing violent crime rate, and in response to all that, Governor Moonbeam is pushing a proposition that will release even more convicted felons? Yes, that is exactly what Brown is doing. Talk about tripling down on failure! And yet again, his buddy Kamala Harris is right there helping him out with the EXTREMELY misleading name for the proposition, the “Public Safety and Rehabilitation Act of 2016.” Conveniently, for the benefit of the uneducated, lazy California voters, that name sounds like a no-brainer. All of this should leave one wondering, “Who in the hell is pushing this?” If you are wondering that, as I was, following the money is the quickest way to find that out. Thankfully, with the advent of the internet, that is not nearly as difficult as task as it once was. By visiting the CA Secretary of State website, you can find out who is supporting this measure monetarily. 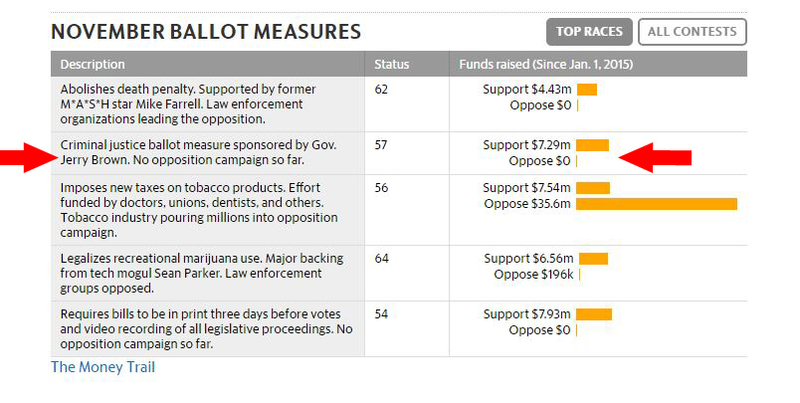 Looking at the four committees listed, one is clearly donating the most money. 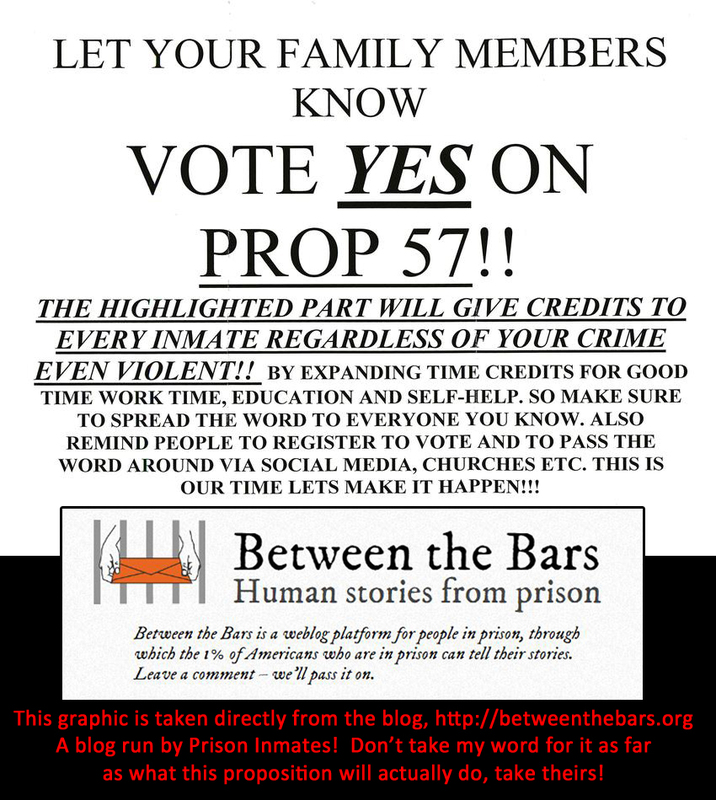 The “Yes on Prop 57, Californians for Public Safety and Rehabilitation” (what a total crock for a name!) committee has donated over $6.9 million. By the way, try Google searching that committee name and see what you find, or more accurately, don’t find. Now that you know who is supporting the bill, take a look at who is opposing it. Just a list of a whole bunch of people who have the actual public safety in mind, like district attorneys, and sheriffs, not to mention a metric crap load of us working, line level cops. Here is the major difference though, this is a bunch of civil servants who do not have millions of dollars to throw at the election like Brown and the Democrats do. Folks, please, for the sake of all our safety, help us help you. Vote NO on Prop 57!